An Ontario court's decision to stay charges stemming from a fatal stage collapse before a Radiohead concert is just another example of inadequate funding of the Canadian court system, a Toronto lawyer says. An Ontario Court of Justice decision to stay charges stemming from a fatal stage collapse before a Radiohead concert is just another example of inadequate funding of the Canadian court system, a Toronto criminal defence lawyer says. "The system is run on a 1970s model with paper and antiquated computers," said Frank Addario. "People are working hard in the system but there's no room for error when something unexpected happens. It's all because of a business decision made by the government not to fund the system." On Tuesday, Justice Ann Nelson ruled that the case against Live Nation, an entertainment company, and an engineer, had taken too long to come to trial and had violated the rights of the people charged to a timely decision. 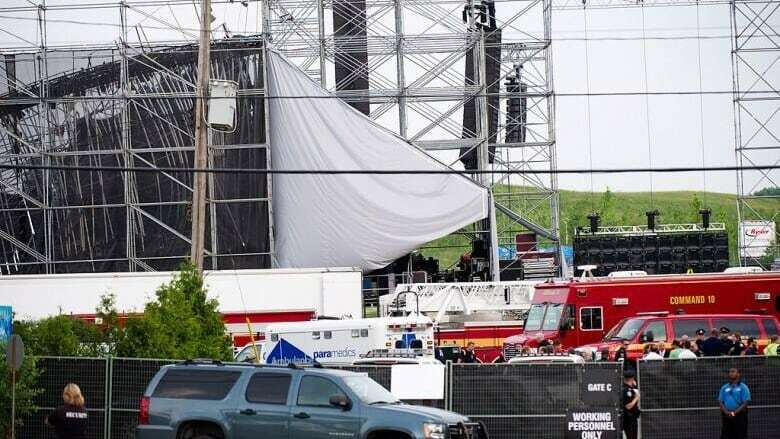 Live Nation and engineer Dominic Cugliari, were charged after an outdoor stage collapsed prior to a June 2012 Radiohead concert in Downsview Park. The collapse killed British drum technician Scott Johnson, 33, and injured three others. After the recent landmark R. v. Jordan ruling, there is a timeline for court cases to be completed — 18 months for provincial court and 30 months for the Superior Court — to ensure that the accused person's Charter right to a trial without unreasonable delays is upheld. Addario agrees with the R. v. Jordan ruling, saying that no one, neither the victim nor the defendant, wants a trial to drag on for years. But, he adds, the Supreme Court's ruling was designed to pressure the government to properly fund the judicial system. "What the Supreme Court said was [long delays are] not good for victims, witnesses or defendants and we need to set a firmer rule to encourage people to bring the cases to trial more quickly … and encourage the government to fund the court system as if it were as important as roads or schools or hospital beds," said Addario. The main criticism of the new law usually comes from victims, says Addario, who are upset because they weren't able to get justice. "If victims are angry at anybody when cases run out of runway, they should be angry with the government." One of the delays that derailed the stage collapse case was the appointment of the original trial judge, Justice Shaun Nakatsuru, to a higher court, which meant he was no longer able to preside over the case. "The system couldn't accommodate a case of this complexity and size. And if the government wants to bring complex cases into the system it has to allocate sufficient resources into the system," said Addario. "What really should happen is that cases should never get that close to the line." He adds that if the Supreme Court had made this decision 30 years ago, there would be sufficient resources to try the most complex of cases and "there would be nobody walking free without an adjudication on their case on the merit guilty or not guilty."